In the old days, when you wanted a custom jewelry piece, you’d head down to the local jewelry store, have the jeweler sketch out something with you on a sheet of paper, and then hope that the actual piece comes out as you expected. It was a long, expensive process, with no guarantee of getting what you hoped for. Thanks to ingenious programmers and artists and their ability to hook into the APIs of online 3D printing services, websites that let users design and order their own 3D printed jewelry, right on the screen, are popping up all over. It would have seemed like science fiction just a decade ago. I was recently alerted to a such a site this week, one that really got my attention. 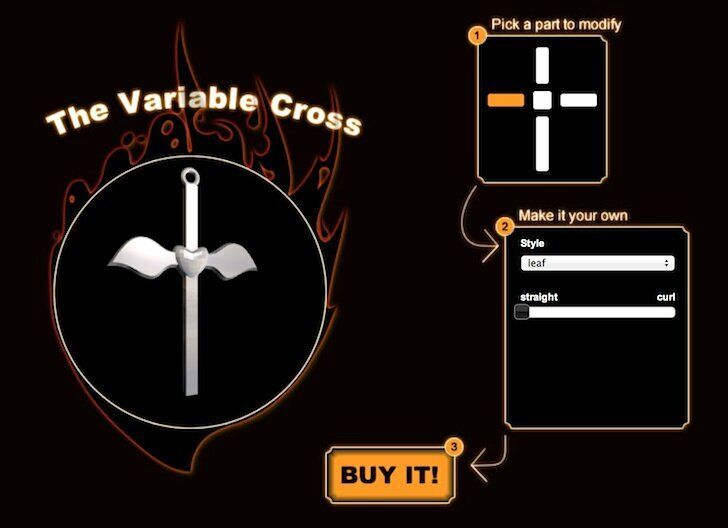 It’s the Shapewright site, which I’d seen before, but now there is a product on it called the Variable Cross. And it’s awesome. It’s a silver pendant that starts out as a standard cross, that you can customize into a variety of extremely interesting designs. you simply select the element of the cross you want to alter, and then change its length, thickness, edges and even the shape of it–you can choose from shapes like a guitar, a blade, a bullet and more. The beautifully rendered design spins around on its vertical axis, while you change it’s design, in realtime. When you are finished, just click Buy to pay for it, and then wait for it to be shipped. The website is the brainchild of artist Dolf Veenvliet, whose work you can find at macouno.com. He’s an artist who has been working with new technology for over a decade. He’s spent a lot of time over the last couple years experimenting with 3D printing and related technologies. He considers one of his most notable endeavors to be Entoforms. The base models for the page were all made in Blender 3D by Veenvliet, and exported using a custom python script he wrote. The site uses the brand new WebGL technology. He doesn’t actually 3D print the jewelry himself, instead he sends the cross design file to Shapeways, where it is 3D printed in sterling silver on their high end printers, and shipped to you within four weeks. Go to the Variable Cross page and try it for yourself (works best in Chrome). You don’t need to sign up to use it; in fact, you’ll be designing within seconds. I recorded a screencast of me playing around with the Variable Cross, that you can see below. Be forewarned: it’s addicting.